Happy Monday, friends! I can’t believe that December is here! 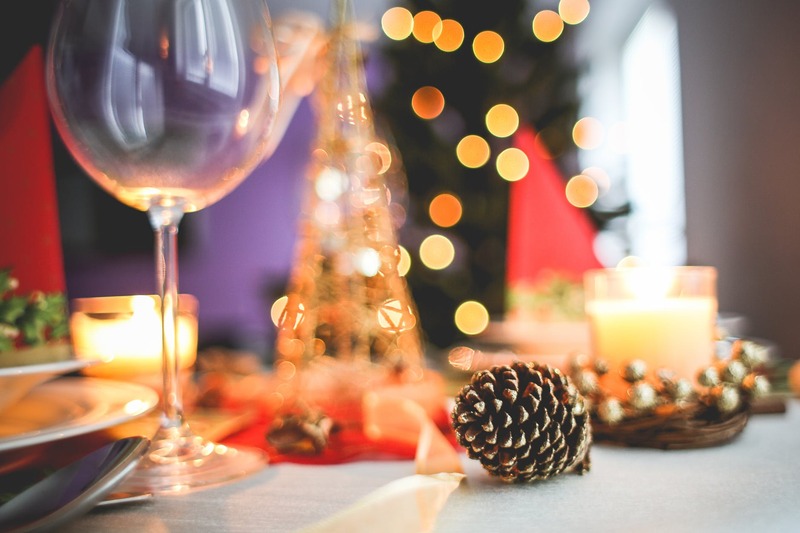 Have you started making the rounds on the holiday party circuit yet? I hope that I got to you in time. Two weeks ago we talked about how we can travel “smartly” this holiday season. If you missed that blog post, I encourage you to check it out here. In that post, I offered tips for making smart choices when it comes to food and drinks when we’re shopping and traveling this year. The key is to make those choices throughout the coming months as to not let things with your health get out of control during the busiest time of year. Today, I’m here to share some ideas with you on how to throw or attend a conscious cocktail party. I think the key word here is conscious. All it takes is a few seconds of thought and planning to really make better choices this holiday season. There’s a lot of eating out, a lot of partying to do, and a lot of celebrating. Small, conscious choices can really make a big difference. I love hosting people (especially this time of year) at our home. I love, love, love to cook and to entertain. I also love to prepare super healthy, delicious options for my family and friends to enjoy while they are visiting. 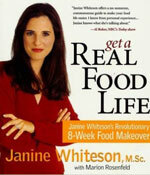 Usually, no one can believe that what they are eating at my cocktail parties is considered health food. Before I share a few of my favorite recipes (one from me and one from my girlfriend Ivy), a few things to remember. I like to keep things simple when I entertain. 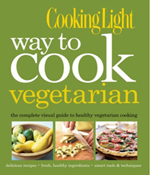 I start by cooking with healthy, fresh ingredients, followed by preparing snacks that are low in sodium, low in carbs, and are heart healthy. I always try to incorporate a few meat free items for my vegetarian friends and I end by purchasing some ready-made store bought, healthy favorites. All easy, all delicious, all nutritious. So, without further ado, here are my favorite “conscious cocktail party” staples. Let’s start with an absolute favorite of mine. This recipe comes from the kitchen of my good friend, Ivy. The first time I ate it at her home, I fell in love. It hits every mark that I mentioned above. I don’t entertain without it. This next recipe is mine and it’s always a crowd pleaser. I started making these when I lived in London in 1988! They were light years ahead of us in terms of the healthy food movement and these became a staple of mine. They are high in protein, low in carbs and calories, and taste incredible! Mash all the above ingredients together while keeping the consistency chunky. Pepper to taste and spoon onto individual sized servings of butter lettuce cups. These next few party favorites of mine are all pre-made and hail from one of my favorites, Trader Joe’s. Don’t be afraid to make things easier on yourself by making some shortcuts. 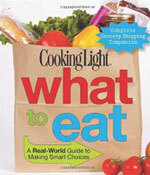 Read labels for sodium and fat content and make healthy, conscious choices. 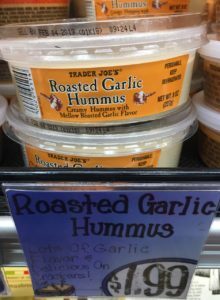 Trader Joe’s Roasted Garlic Hummus Dip. 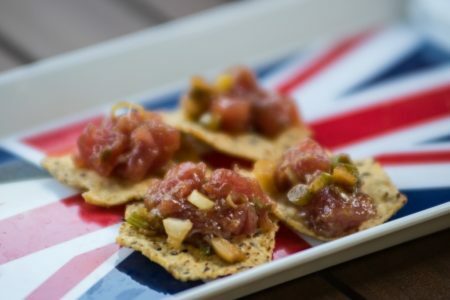 Serve this with cut up fresh vegetables or my beloved GG crackers. 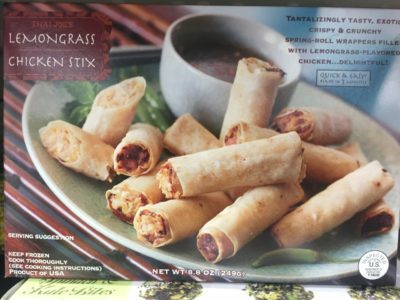 Trader Joe’s Lemongrass Chicken Stix. 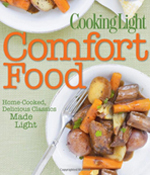 A whole lot of flavor, very few calories, low sodium content and easy as pie to prepare!! 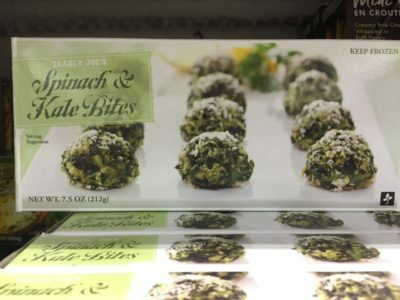 Trader Joe’s Spinach and Kale Bites. 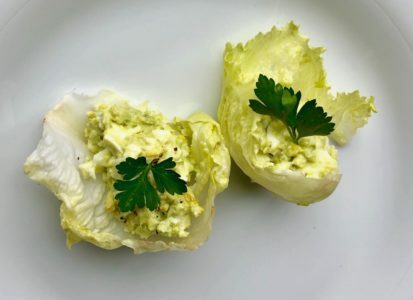 Full of healthy greens and a good portion of Parmesan cheese, these little bites are easy to eat in a party setting and are always a favorite of my vegetarian friends. A bit higher in sodium than the other pre-made apps I’ve suggested so I would keep portion size to under three bites. Another note: I like to almost double the cooking time that it recommends on the box. You’ll get a crispier outer shell that I think adds some nice texture and flavor. Lastly, let’s talk about cocktails. ‘Tis the Season, right? I think a good rule of thumb for a lot of reasons is to keep the cocktail consumption to a few. “Conscious cocktail” choices are usually clear in color (think: tequila or vodka) and are mixed with something even clearer (think: club soda). I like to add lots of fresh lime to my vodka or tequila sodas. Mixers full of unnecessary sugar will surely pack on the calories (and the hangover). Before I send you off to host your soirees, one last note. A lot of times if I’m really trying to rein it in but still enjoy myself well attending parties hosted by others, I contact the host and ask if I may bring something. No host is going to turn that down. This is my chance to help out while also providing something that I know will be a healthy choice once I arrive. My friends almost always provide healthy choices but there’s no hurt in bringing some along.